How to Recover Deleted/Lost Files Free? Finding a free yet reliable Windows data recovery software is hard to believe, even though there is no dearth of options available online. But the data integrity matters a lot when it comes to choosing a dependable freeware solution. Ever faced Data loss situation? Have you ever come across a situation where you have lost your valuable data from any of the devices like hard drive, removable disk, digital camera, smartphone? It can be due to any technical glitches such as sudden shutdown, overheating, manual deletion of data, etc. Though, data loss can be prevented by taking backup of the entire data on a regular basis. However, the data loss situation can happen to anyone at any time. 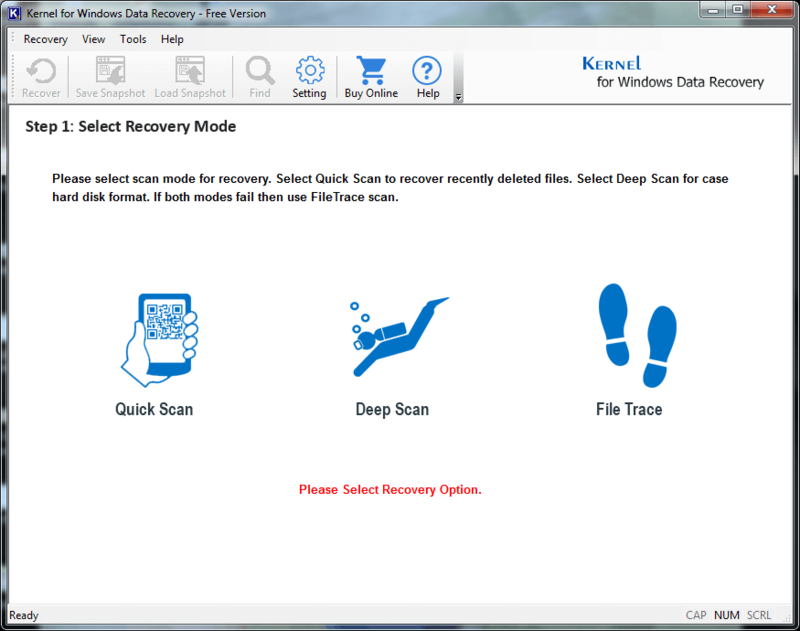 Therefore, Kernel has launched a reliable and user-friendly windows data recovery freeware – for absolutely free. Kernel for Windows Data Recovery Free version Software is a powerful tool that recovers entire deleted, lost and formatted data and files from hard drives, removable drives, CD/DVD, iPods, Digital Cameras, FAT (File Allocation Table), and other digital devices absolutely free. It can be downloaded from the Internet or its official website for personal as well as businesses use. Recovers your lost and deleted files and folders just in a 3 steps – Select, Preview, and Save. Performs thorough recovery of permanently deleted files and folders. Allows smooth recovery of entire multimedia files including photos, movies, songs, videos, etc. in their original state. Provides facility to recover all essential data which include email files such as EML, PST, DBX, EML, documents like Doc, xls, .ppt, archive files (Zip and RAR), database files, Internet files, etc. in just a matter of minutes. Scans and recovers corrupt and damaged hard drive partitions. Provides a facility to view recovered files even before restoring them at a desired location using its Preview option facility. Conducts complete safe and secure data recovery task. Quick and efficient: As far as recovery process is concerned, this tool stands out on the top among all the data recovery tools in the web market. It recovers lost, corrupted or deleted data in just a matter of minutes. It is very quick and efficient to restore lost data files and folders. Virus/Malware Free: There are numerous free data recovery tools available on the web that brings malware or virus in the systems. 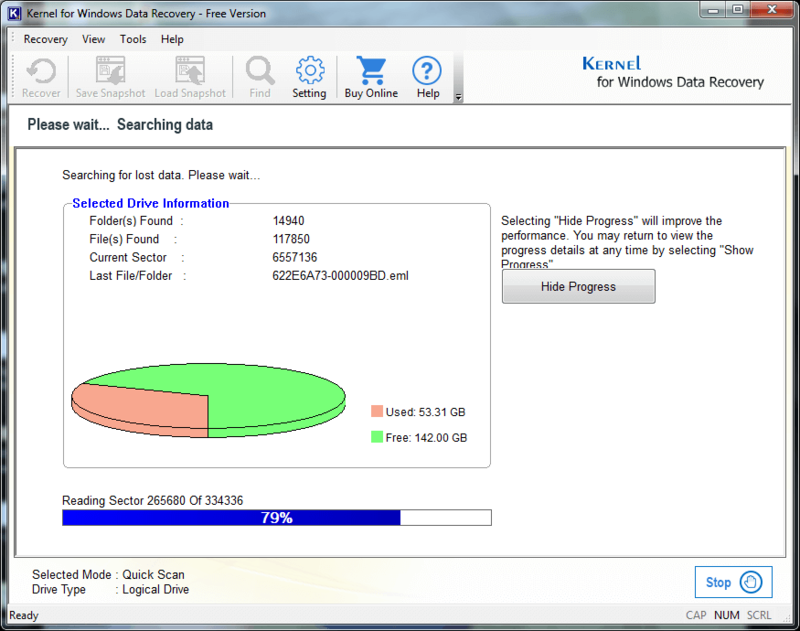 But Kernel for Windows Data Recovery Free version tool is absolutely free from virus and malware attacks. Available Online: It’s Freeware, Home License, and Corporate License can be easily downloaded from its official website. Completely Free: Kernel brings it to cater your all Windows related issues completely free. It lets user to recover 2 GB data from hard drive, removable drive, digital cameras, and other digital devices without paying a single penny. Round the clock Support available: The tool comes with 24*7 technical support under highly skilled technical gurus to resolve your queries. 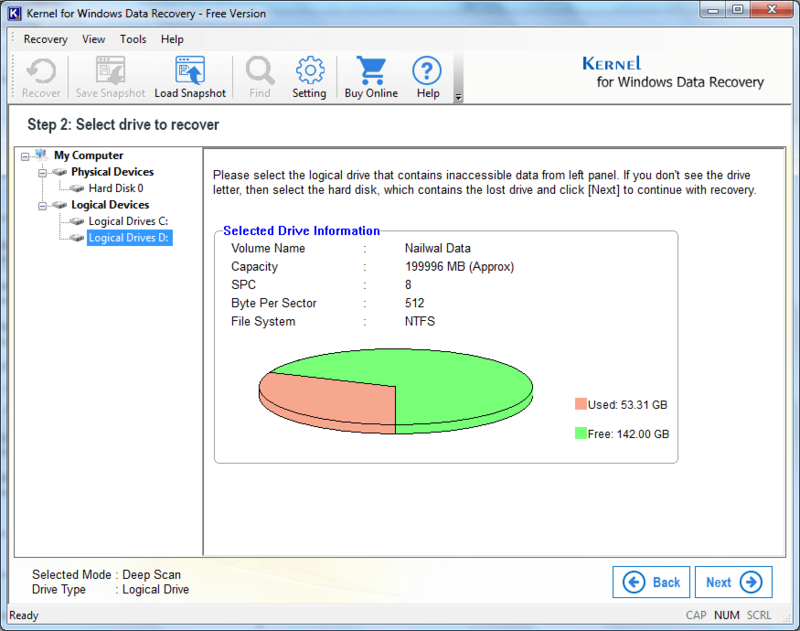 Note: Kernel for Windows Data Recovery Free version Software allows you to save 2 GB of data for free without any limitations. Step 1. 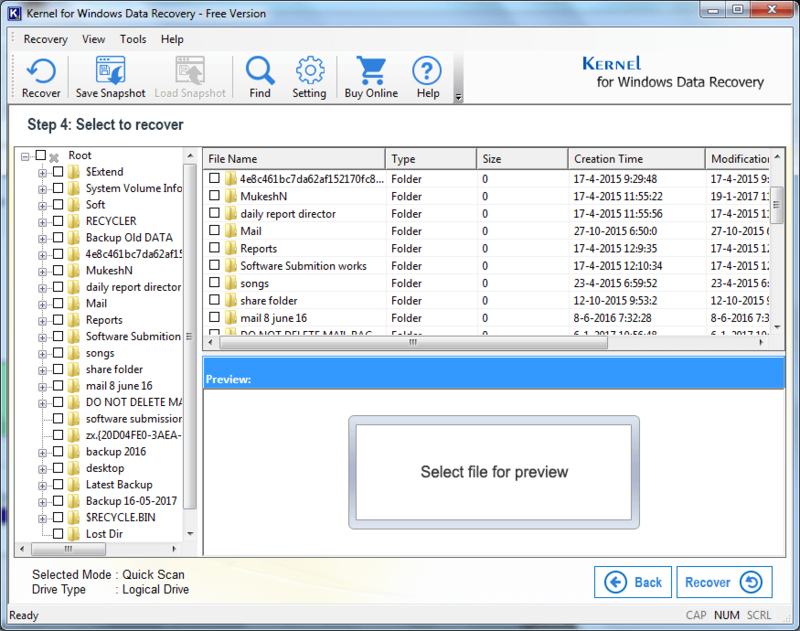 Download Kernel for Windows Data Recovery Free version Software. Step 2. Run the software. Step 3. Select the appropriate recovery mode to scan corrupt drive or partition. Quick Scan Mode: Opt for Quick Scan to recover recently deleted file(s) or folder(s). Deep Scan Mode: Select Deep Scan in case of hard drive crash/format, partition deletion, re-creation etc. File Trace Mode: If both Quick scan and Deep scan don’t work, select the File Trace mode. Step 4. Now select the particular drive that you want to recover and click Next. Step 5. Now let the tool scans the selected drive to search lost or deleted data. Step 6. Here you can see your recovered data in the Preview pane. Step 7. Finally opt for the location where you want to save the recovered data. And this way you can recover your lost data up to 2GB from any digital devices for completely free.